During a December 2014 inspection of a landfill sediment pond at a southwestern Ohio power-generating station, sinkholes were found above the southernmost 48-in. PVC pipe directly behind the headwall at the inlet to the pond. Dual pipes convey water from the landfill collection system under the landfill haul road to the pond. Upon further inspection, it was discovered that both outlet culverts were cracked at the interface between the concrete headwall and the pipe. The cracking was primarily on the side and top of each pipe, creating a few inches of separation in the direction of flow. Based on the location of the cracking at the headwall interface and the cracks’ positions on the pipes, engineers determined that the headwall had settled since original construction in 1999, causing the cracks. Sinkholes formed when overlying soil dropped through the cracks into the pipe. The damage did not appear recent. Three solutions to the problem were considered: full removal and replacement of the pipes, lining the culverts and conducting interior localized repairs. Removal and replacement was not evaluated, since that would be the most expensive option, take the longest time and disrupt landfill operations. Lining the culverts would also be expensive, requiring a cured-in-place pipe (CIPP) or slip-lining along the entire length of pipe. This solution was also dismissed. The most practical approach was also the most economical: interior localized repairs. These could be completed in a short time with minimal disruption to landfill operations. HydraTech Engineered Products’ HydraTite internal joint seal was selected for the repairs. The HydraTite system consists of a rubber seal held in place by stainless steel retaining bands. The bands are expanded and locked in place with wedges and provide enough pressure to create a watertight connection without risking pipe integrity. When necessary, an additional stainless steel backing plate can be installed behind the joint for extra support. The rubber seals allow for minor movement across the joints, which is preferred to a rigid system. A HydraTech inspector assessed each pipe to determine what materials would be used and how tight the bands needed to be. The surface of each outlet pipe was then cleaned. Next, each pipe was measured to determine the diameter and length of seal required. 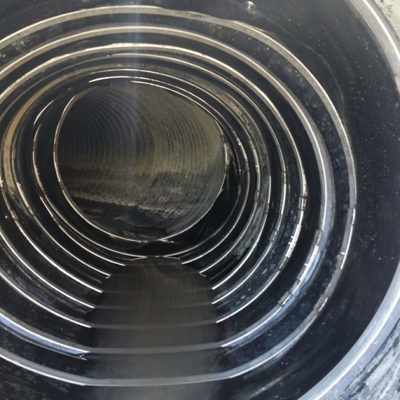 It was necessary to “sleeve” several HydraTite seals before installation to provide additional length over the defective areas and eliminate further infiltration. Sleeving is a process in which seals are interlocked to provide a continuous length on a defective area of piping. After the repairs were made, the sinkholes were backfilled with soil to prevent surface water from entering. The entire project took two days to complete and provided a long-term, permanent repair for the power station.